It's been well documented that seafood caught in the wild contain many important vitamins and nutrients necessary for good health. Now that whitefish season has begun in Alaska, I'd like to share one of my favorite ways to prepare seafood with you. 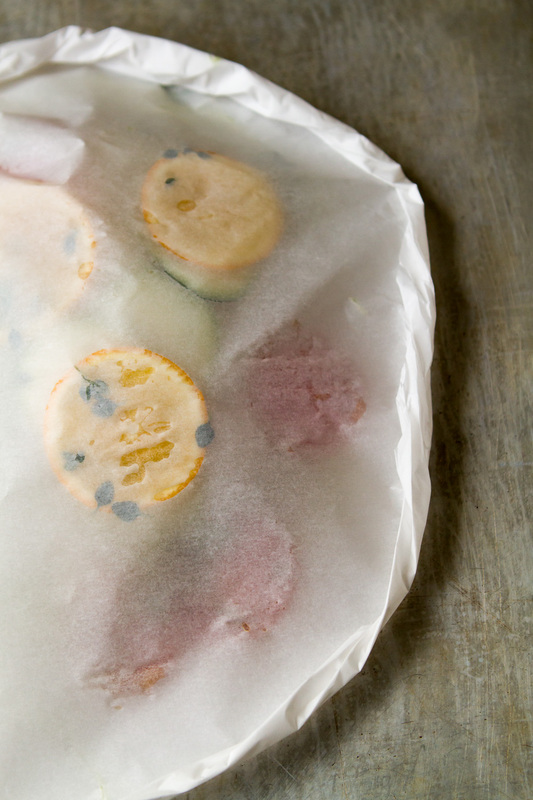 Fish en papillote, or fish in parchment paper, is a healthy, low fat, and delicious cooking method that locks in flavor and moisture. It's perfect for dinner parties as you can prepare the fish packages in advance and bake them off when guests arrive. There are 6 different species of fish in the Alaska whitefish category: halibut, cod, black cod, sole, rockfish, and pollock. All would work nicely in this recipe. You can find these varieties at your fish market or at Whole Foods. Here's a brief description of each to help you choose. Halibut-Halibut has a sweet, delicate flavor with a firm and flaky texture. It has a pure, snow-white flesh and is harvested March through mid-November. Black Cod- Also named sablefish, it has a succulent rich flavor and velvety texture with a beautiful snow-white fillet, perfect flake and rich oil content. Alaska boasts the largest black cod fishery in the world. Pacific Cod- One of the most popular whitefish varieties, Alaska cod accunts for 99% of the cod harvested in the US. It is moist and firm with a distinctive large flakey texture and slightly sweet flavor. Alaska Pollock- Pollock's flakey and tender texture, snow white color and mild flavor make it an excellent choice for poaching, broiling, steaming, sauteing, and deep frying. A recent federal ruling stipulates that only pollock caught in Alaska may be marketed as Alaska pollock in the US. Sole- Is also known as floounder. Alaska sole is a lean, tender flatfish. It's mild taste makes it widely appealing and easy to cook with. Rockfish- Alaska rockfish is a group of lean fish speies harvested in the Gulf of Alaska, ranging from mild to full in flavor. Rockfish have a pearly-white color and a tender yet meaty texture. Cut 2- 18" sheets of parchment paper. Fold each sheet in half. Draw half of a heart shape ( it doesnt have to be perfect). Cut out. Set aside. Unfold the parchment heart. Place half of the leeks onto the middle of one side. Top with the fish filet. Drizzle lightly with olive oil and season with salt and pepper. Add zucchini and tomato slices on top and repeat with a drizzle of oil, salt and pepper. Top with lemon slices and herbs. Close the packet by making small, tight, overlapping folds down the outside edge of the heart. Seal by twisting tail end to seal. Repeat with second parchment heart. Place both onto a sheet pan and bake at 375F for 15-20 minutes, depending on the thickness of your fish. Serve immediately.